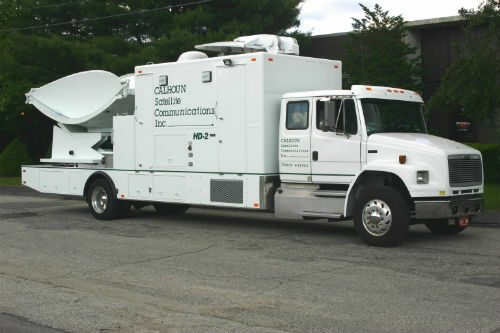 Calhoun Satellite Communications, an industry leader in mobile satellite uplink services, announced today that it has upgraded its multiplatform DSNG fleet with ATEME’s MPEG-2 and H.264 4:2:2 10-bit contribution encoders and decoders. Beginning in early 2012, Calhoun has covered several professional football, basketball, motor racing, and national news events using ATEME’s Kyrion CM4101 encoder and DR8400 IRD, the industry’s first H.264 HD products to provide 10-bit 4:2:2 video compression. The CM4101 and DR8400 products also support MPEG-2 operation for legacy mobile uplink requirements. “Calhoun Satellite is proud to be the first mobile uplink operator with a Dual Dish C/Ku Band vehicle on the road, and now a 10-bit codec on board” said Calhoun Satellite Communications owner David Fruitman. “We have enjoyed working with the ATEME team and have found their products easy to use and reliable. Their picture quality and technical support are second to none” added Fruitman. “The field experience and operational input that we gain by working with companies such as Calhoun Satellite Communications is invaluable and drives our product development plans. Our Kyrion encoders and decoders are successful in this market because they provide the flexibility to address the fluid environment faced by mobile uplink operators.” commented Brendan Smith, Director of Sales, Broadcast and Satellite at ATEME. Today, Calhoun's inventory includes 2 Dual Dish C/Ku trucks, 3 Ku trucks, 1 C band and 1 Ku trailer. Calhoun's trucks are housed between Miami, Florida and Pittsburgh, Pennsylvania giving easy access to a wide geographic area throughout North America. Founded in 1986, Calhoun Satellite Communications (www.calhounsatellite.com) is the oldest, continuous, transportable earth station provider in the United States. With corporate headquarters in South Florida, Calhoun has grown significantly throughout the years always maintaining the highest level of customer service and attention to detail.